I was reading the Art Spiegelman chapter of Arie Kaplan's "Masters of the Comic Book Universe Revealed!" 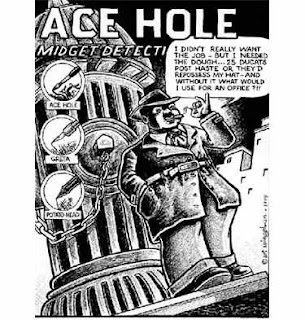 In it he mentioned Spiegelman's "Ace Hole Midget Detective." 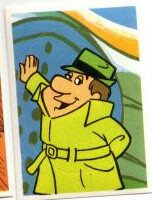 Of course this reminded me of Hanna-Barbera's Saturday morning cartoon "Inch High Private Eye." I wondered which came first? Kaplan cites 1974 as the year Spiegelman published Ace Hole, while Inch High ran on NBC starting in September, 1973. Pretty close. Maybe something was in the water. Or, maybe this was a prior term. This site says that "One Inch High Private Eye" is slang for a "short person usually found in the work place who is enjoys snitching on fellow colleagues to the big boss." Or, maybe the phrase is some derogatory slang for the male member? Art Spiegelman's "Ace Hole Midget Detective"
Hanna-Barbera's "Inch High Private Eye"
Upgrade Soul by Ezra Clayton Daniels is self-described as an immersive science fiction graphic novel written and illustrated by Ezra Claytan Daniels. "It's the story of an elderly couple who become the guinea pigs of a visionary procedure that aims to revivify them by filtering toxins from their bodies on a molecular level. When the procedure experiences a fatal complication, the couple is faced with severely deformed, though intellectually superior duplicates of themselves. Soon, it becomes clear that only one version of each individual can survive, and the psychological battle for dominance begins." Brief Histories of Everyday Objects by Andy Warner is a charming set of cartoons that provide exactly what they say they do, in an entertaining way. The history of kitty litter, for example. They describe their philosophy: "While we aren’t implying that it’s time to pull away from the classics, we do believe that there is a more entertaining way of consuming content: Visual Stories. That’s what Tapastic is built around and that’s what we are excited to share with all of you!" Modest Medusa by Jake Richmond is an adventure story about a man who finds an infant Medusa has invaded his house. She comes from another land through a mystical portal that's in his storage closet. Vattu by Evan Dahm. Vattu is an adventure story set in 855 in a strange world. 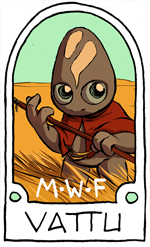 It begins when a girl name Vattu is born to a tribe of nomads. The action is low-key, but concise, and the story is told with as few words as possible. Simple, like the lives of the nomads on the grassy plain. The Secret Knots by Juan Santapau. Santapau describes his work as "comics about things we do without knowing why." He has been at it for a while, since the archive reaches back to 2006. Most of the short stories seem to be self-contained in a single web page, although there are hints that the characters live in a shared world. Check 'em out, then go ahead and vote.